Fuchs' dystrophy is a disease of the cornea. 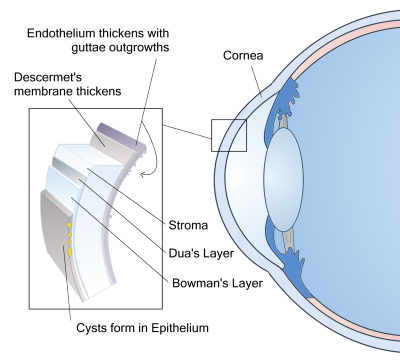 It is when cells in the corneal layer called the endothelium die off. These cells normally pump fluid from the cornea to keep it clear. When they die, fluid builds up and the cornea gets swollen and puffy. Vision becomes cloudy or hazy. Fuchs' dystrophy has two stages. In the early stage (stage 1), you may notice few, if any, problems. Vision is usually hazy in the morning but gets better throughout the day. This is because your eyes normally stay moist when they are closed during sleep. But when you are awake, the fluid dries normally. With the later stage 2, vision remains blurry all day. Too much fluid builds up during sleep and not enough dries up during the day. Also, tiny blisters may form in the cornea. The blisters get bigger and eventually break open, causing eye pain. People in their 30s and 40s may have Fuchs' dystrophy but not know it. Vision problems might not appear until age 50 or later. Women are more likely than men to have Fuchs' dystrophy.